Semtech Corporation (Nasdaq: SMTC), a leading supplier of analog and mixed-signal semiconductors, today announced that its new LoRa® geolocation solution has been integrated into a LoRaWAN™-based Internet of Things (IoT) network that covers 12 square kilometers of Glasgow, including the commercial center, Merchant City and the West End. This low power, wide area network (LPWAN) will help enable the development and use of devices such as building and indoor environmental monitors, pollution sensors, tags for tracking valuable assets and social care devices designed to support independent living. 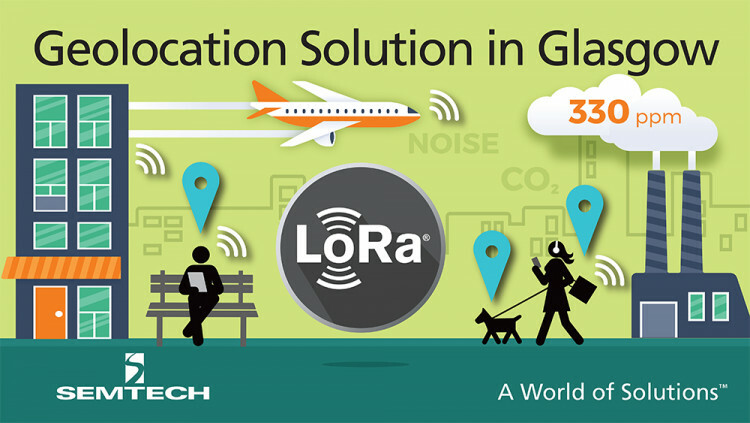 Currently being used to monitor air quality and enhance intelligent transport systems, the introduction of Semtech’s LoRa geolocation solution now opens new possibilities for Glasgow’s LPWAN. For example, it can be used in circumstances as diverse as healthcare providers tracking the behavior of patients living with dementia or by waste operators to monitor the location of their trucks across a city. The network was deployed as a collaborative project involving Semtech, Stream Technologies, Boston Networks and CENSIS. The group is also working on the installation of a similar sensor network in Inverness, Scotland to monitor conditions in more rural environments. Glasgow was selected as the test case because of its similarities to many major metropolitan areas worldwide. The city includes a grid system like major US conurbations, older historic spaces and a mix of urban and extra-urban environments – all of which are ideal for testing low power radio network performance. All statements contained herein that are not statements of historical fact, including statements that use the words “enable,” “will” “offers,” “opens,” or other similar words or expressions, that describe Semtech Corporation’s or its management’s future plans, objectives or goals are “forward-looking statements” and are made pursuant to the Safe-Harbor provisions of the Private Securities Litigation Reform Act of 1995, as amended. Such forward-looking statements involve known and unknown risks, uncertainties and other factors that could cause the actual results of Semtech Corporation to be materially different from the historical results and/or from any future results or outcomes expressed or implied by such forward-looking statements. Such factors are further addressed in Semtech Corporation’s annual and quarterly reports, and in other documents or reports, filed with the Securities and Exchange Commission (www.sec.gov) including, without limitation, information under the captions “Management's Discussion and Analysis of Financial Condition and Results of Operations” and “Risk Factors”. Semtech Corporation assumes no obligation to update any forward-looking statements in order to reflect events or circumstances that may arise after the date of this release, except as required by law.